Cometdocs is a free online file converter. It converts PDF files to Word, Excel, PowerPoint, AutoCAD, HTML, and other formats. You can also create PDF files from almost any file format, including XPS, Publisher and more. You can also store your documents online and share them. You get 2GB of storage with the free account. Converts files right inside Google Drive, no need to leave the service. 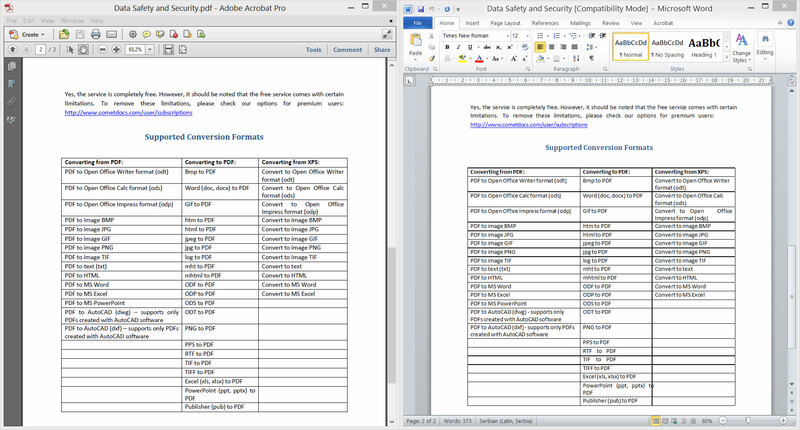 Converts PDF to Word, Excel, PowerPoint, Text, Images, OpenOffice (not just PDF to Word like Google Drive) formats. Unlike Google Drive itself, files larger than 2 mb can be converted. No limit on page numbers. There is a limit for free users of five free conversions per week, but this is higher than most similar services. 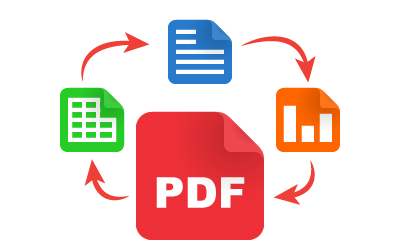 Images and documents in Microsoft Office Formats (not Google Docs formats) can be converted to PDF as well, without leaving the service. Users can use the Chrome app with the free account as well. The only difference between the free and the premium account is in the number of conversions per week (free users have 5 available conversions per week), which is more than other similar services offer.